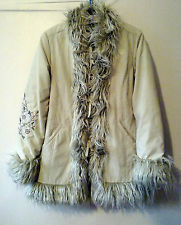 A knee length sheepskin coat with huge fur collar & trim. Not one to wear out in the rain unless you wanted to smell like an old dog (Early 70’s). The Afghan coat was an ethnic goatskin or sheepskin coat that was decorated with silk embroidery on the front panel and did up with hooks not buttons or toggles. . Afghan coats were first seen on the streets ofLondonin the late 60s – famously the Beatles were pictured wearing Afghan coats on the cover of their classic album “Sergeant Peppers Lonely Hearts Club Band”. The original 60s version of the Afghan coat originally was imported into London designer shops or boutiques direct from Afghanistan. As the 70s drew on and the coats became more and more popular, the coats were imported from Iran and Turkey to keep up with demand. Some purists insisted that the Iranian and Turkish versions smelt more that the original Afghan variety but they were indistinguishable in look and fashion credibility. You may remember programmes like the cult TV series Budgie that starred Adam Faith. He would wear an Afghan coat in the 1971 show, and it took on a little sinister edge, as he was not a good guy at all.. The ladies and men could wear this coat, and it really was a great warm winter coat, and fashionable too. Mostly the ladies would wear this just above the knee, but the guys tended to wear this a little longer as a coat that would go half way to the shins. Afghan coats were expensive to buy and made a strong statement that the wearer was individual. And that he or she may smoke pot! Some people would cover the coat in sweet smelling patchouli oil , possibly to disguise the smell of the coat (or maybe the smell of the pot!) and this smell also became fashionable.